IGLYO – The International Lesbian, Gay, Bisexual, Transgender and Queer Youth and Student Organisation – is worried about a nd appalled by current state of affairs and recent negative developments concerning LGBTQ people in Russia. Yesterday, we saw the adoption of a harsh piece of legislation prohibiting so-called ‘gay propaganda’ by 436 members of Russian State Duma. The law inflicts hefty fines on anyone who “imposes non-traditional sexual relations” on minors. The adopted bill puts at risk organisations, activists, mass media and any person who would dare to speak or spread information about LGBTQ issues in a positive or neutral way, thus endangering and even dramatically limiting freedoms of expression, association and assembly for those who support equality of LGBTQ rights. This oppressive situation has already been a reality for many Russian activists. Yesterday also, prior to the 2nd and 3rd readings of the anti-propaganda bill in the State Duma, around 30 LGBTQ activists were violently detained by the police while holding a peaceful protest demonstration in front of the State Duma building in Moscow. They were also subjected to violent attacks from religious bigots and anti-gay counter-protesters, including attacks by minors. 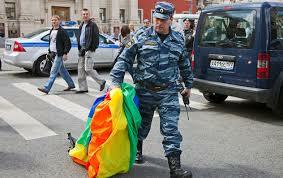 What is more, the police did nothing to protect the peaceful demonstrators against assaults by homophobes. IGLYO would like to pay attention that these disturbing and outrageous developments have become a continuous state of affairs in Russia. Recent unprecedented growth in the number of hate-motivated crimes towards LGBTQ people or those who are perceived as such demonstrates the aggravation of the human rights situation. Human rights exist in a precarious state despite the fact that the Russian Federation is a signatory to a numerous international and regional human rights treaties, including the European Convention on Human Rights and Fundamental Freedoms. IGLYO is worried about the worsening of the psychological and social climate for Russian LGBTQ people of all ages, especially youth, who are subjected to bullying and exclusion. The Children 404, the term coined for LGBTQ teenagers by a Russian journalist, are left behind to deal with issues of acceptance, coming out and violence on their own, in silence. Yesterday’s adoption of the anti-propaganda law, as well as the entire public debate around it for more than a year, has done nothing but added fuel to the never ending fragmentation of Russian society into the so-called right and wrong. IGLYO promotes the inclusion of all young people in Russian society, regardless of sexual orientation or gender identity. IGLYO calls on the President Vladimir Putin to stop this law in the final phase, and take a stand for human rights by refusing to sign the adopted bill into law. If signed, it will not only increase stigmatization and discrimination against LGBTQ people but will also provide additional instruments for reprisal with human rights activists opposing current crackdown on freedoms in Russia. IGLYO urges international structures, organisations and communities to put pressure on Russian authorities to repeal the unconstitutional legislation. IGLYO calls for the respect of fundamental rights and freedoms of all Russian citizens, regardless of their sexual orientation, gender identity or expression, age, political views or religious beliefs.